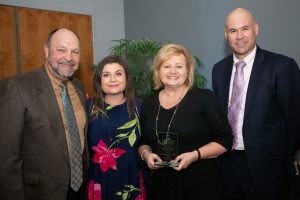 A commitment to community partnerships and outreach efforts with local schools and career centers were among the reasons St. Mary’s Medical Center CEO Janice Ryba was selected the Hobart Chamber of Commerce’s Business Person of the Year for 2019. She was presented the award during the chamber’s annual recognition dinner March 1. Ryba believes receiving the award wouldn’t have been possible without the work and contributions by the hospital’s physicians and clinical staff and administrative team as well as the support staff and volunteers to serve patients and the community. Ryba became CEO of St. Mary Medical Center in 2007. St. Mary Medical Center has been recognized in recent years for its high-quality care and outcomes in cardiology, neurology and stroke care, orthopedics, oncology, maternity care, bariatrics, vascular care, robotic surgery and other patient services, as well as for overall patient experience, care and safety. Major recent achievements include construction of the $17 million, 55,000-square-foot Valparaiso Health Center in 2013, expansion of services at the Portage Health Centers in 2014 and the hospital’s addition of a $40 million Surgical Pavilion and ICU in 2015. Last year, St. Mary Medical Center, in collaboration with its physician network, Community Care Network Inc., opened its South Valpo Immediate Care, Family Practice and Physical Therapy locations on U.S. 30 in Valparaiso.